Sally was a well-known journalist in the early 1970s when she met Swami Muktananda and began working closely with him. She was initiated into the Saraswati order of monks and taught in the Siddha Yoga lineage as Swami Durgananda for 20 years. After leaving the monastic life in 2002, she became a highly popular teacher, workshop leader and author whose books include Meditation for the Love of It, Awakening Shakti and Doorways to the Infinite. We spoke about her fascinating life and work, and she shed light on Vedic concepts such as shaki, kundalini and goddess imagery. Sally Kempton is one of today’s most authentic spiritual teachers. 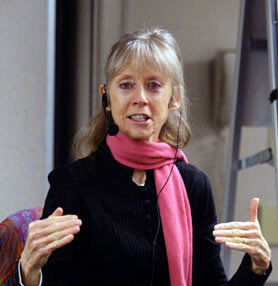 She teaches devotional contemplative tantra—an approach to practice that creates a fusion of knowing and loving. Known for her ability to transmit inner experience through transformative practices and contemplation, Sally has been practicing and teaching for forty years. A disciple of the great Indian guru Swami Muktananda, she spent twenty years as a teaching swami (monk) in the Saraswati order of Indian monks. In her guru’s ashram, she received a traditional training in yoga philosophy and practice, and became a popular teacher, deeply versed in the teachings and practices of Vedanta and Kashmir Shaivism. In 2002, Sally began teaching independently. She now offers heart-to-heart transmission in meditation and life practice through her Awakened Heart Tantra workshops, teleclasses, retreats, and trainings in applied spiritual philosophy. Her workshops and teleconference courses integrate the wisdom of traditional yoga tantra with the insights of contemporary evolutionary spirituality and cutting-edge psychology. Sally is the author of Meditation for the Love of It, a groundbreaking book on meditation, which Spirituality & Health called “the meditation book your heart wants you to read.” She writes a regular column, Wisdom, for Yoga Journal. She offers monthly teleclasses in meditation, and an ongoing teleconference series called the Transformative Practice Journey, which unfolds different aspects of awakening practice. She is one of a select group of teachers in Ken Wilber’s Integral Spiritual Center, and teaches regularly at conferences, and at Kripalu and Esalen. Philip Goldberg has been studying India’s spiritual traditions for more than 45 years, as a practitioner, teacher and writer. An Interfaith Minister, meditation teacher and spiritual counselor, he is a skilled speaker who has lectured and taught workshops throughout the country and in India. He is the author of numerous books, most recently American Veda: From Emerson and the Beatles to Yoga and Meditation, How Indian Spirituality Changed the West, which was named one of the top ten religion books of 2010 by Huffington Post and the American Library Association. He blogs regularly on the Huffington Post. Dennis Raimondi has a Masters Degree in Education from Harvard University and is a former member of the Dean’s Council at Harvard University’s Kennedy School of Government. He is the host of the radio talk show Speaking Freely with Dennis Raimondi www.dennis.tv Dennis’ past guests include: President Barack Obama, Hillary Clinton, Bill Clinton, Mitt Romney, Bernie Sanders, Marianne Williamson, Father Thomas Keating, Dr. Lewellen Vaughan Lee, Radanath Swami, and Sheryl Crow. He recently did a series in collaboration with the United State Holocaust Memorial Museum in Washington DC. Dennis has been practicing meditation for over 45 years.